MORE cookie squares? Yes, and these include Manitoba Harvest Hemp Seed Nut butter. 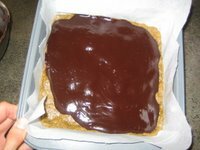 These are my Chocolate Hemp Squares from Vive le Vegan! . I decided to break down the simple steps in photos for you today, shown below. First is the combination of nut butters and maple syrup in the pan. 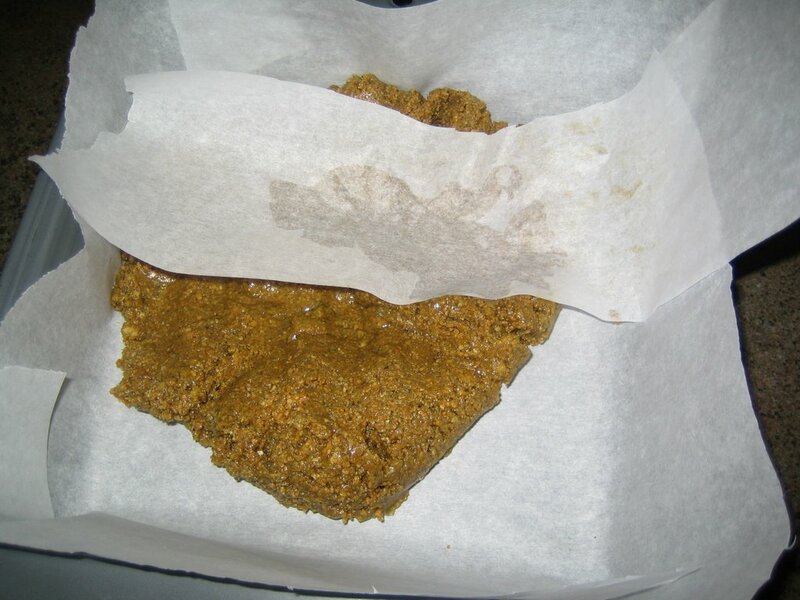 Then the the cereal crumbs (whizzed in a mini-processor) are stirred in and the mixture is pressed into a square pan lined with parchment. 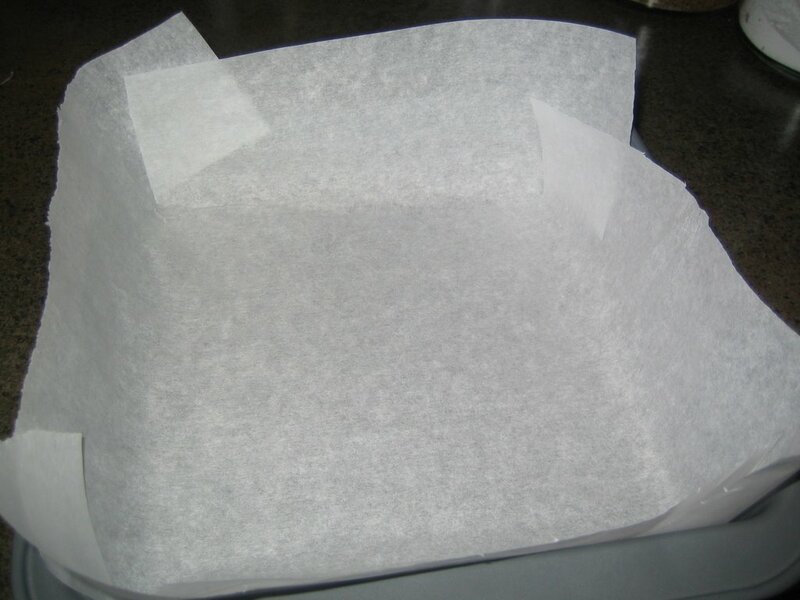 Remember I showed the trick of lining a square pan with parchment? Well, here it is with the corners folded in after cutting. The next photo shows me beginning to press the mixture around the pan with a bit of leftover parchment, to keep it from sticking... then into the fridge for some cooling while preparing the topping. 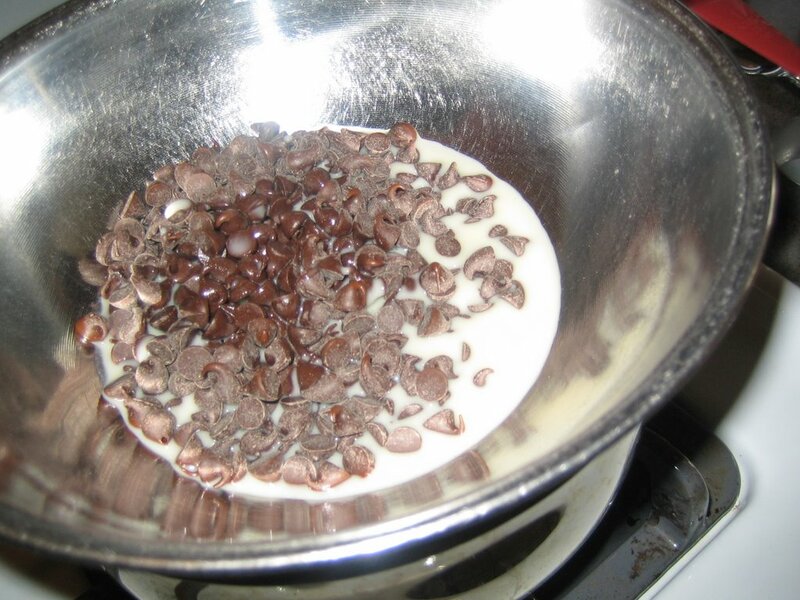 Next, in a saucepan, the chocolate chips are combined with the non-dairy milk. When smooth this chocolate goodness is poured over the base and tilted back and forth to even out... then back into the fridge to cool completely. Want to make these? Well, here's your chance to win a basket of hemp products from Manitoba Harvest! Click here for details on the goodies and contest rules. These bars look fantastic Dreena!! Are these the gluten free squares in Vive (if made with GF cereal)? They look really yummy! I hope that I can win some hemp butter so that I can make them. Have you ever tried Omega's PumpkinSeed Butter? It's very good. If you have, is the hempseed butter similar? We have been unable to find the Hemp products in our area. You are killing me with all the yummy photos of sweets. Good thing I'm not on a sugar free diet! I love how the bars look so moist and delicious. I can almost taste them just looking at the picture! I love how you showed different pics showing the steps to make these bars! They look great! P.S.- Please pick me...randomly, ofcourse! I can't find hemp seed nuts. All I can find is hemp seeds- same thing?? About the contest... If we win- when are you starting to count the three days we have to respond to you? I am away until Monday night for Easter! Hemp nut butter! I didn't even know that existed! Oh, how silly of me to doubt the scope of nut butters. Those look incredible! I don't eat or drink caffeine so I avoid regular chocolate. Is there a white chocolate option (since it has no caffeine containing cocoa powder)? Or maybe a preservatives w/ struesel-type topping? I'm a vegan-leaning vegetarian (flexigan? ), so I don't know this answer. Is there vegan white chocolate available? Ooh, those look yummy. If I don't win the contest and can't find hemp seed butter in my store, guess I'll try it with almond and soy nut butter or two nut butters. When I made the homestyle chocolate chip cookies, I used wax paper to line the pan because I don't have parchment, and it worked fine. Scott, for people who don't eat chocolate, there is always carob. These look amazing! My fingers are crossed for your drawing...I'm still looking for hemp in my area...I really want to know what it taste like. Oh, Yum! I like how you whizzed the cereal up. Good idea for my next treats. An even better idea of my next treats would be with HEMP PRODUCTS! Those look absolutely delicious! I bought some hemp seeds after reading about them in Vive and really liked them. Unfortunately I've never found the hemp seed butter locally, but I'd love to try it! How exciting - a contest! Over the weekend, I made the Apple Cardamom Cake with Lemon-Maple Frosting and MMmmmMMmmmm - rave reviews all around. Great flavor and the texture was perfect. I am really excited to try some of the recipes with new-to-me ingredients, like hemp products. Your picture of the chocolate hemp squares makes me want to start right away! those look good! i've been wanting to try cooking/baking with hemp seed butter. this looks like the perfect receipe to try it out. Ok, so I found some hemp seeds....can I just wizz them like peanuts to make my own hemp nut butter? The health food store I was at, didn't carry the butter. I can't believe I'm comment #19! Well, I should believe it, since I didn't have a chance to visit blogs most of the day. 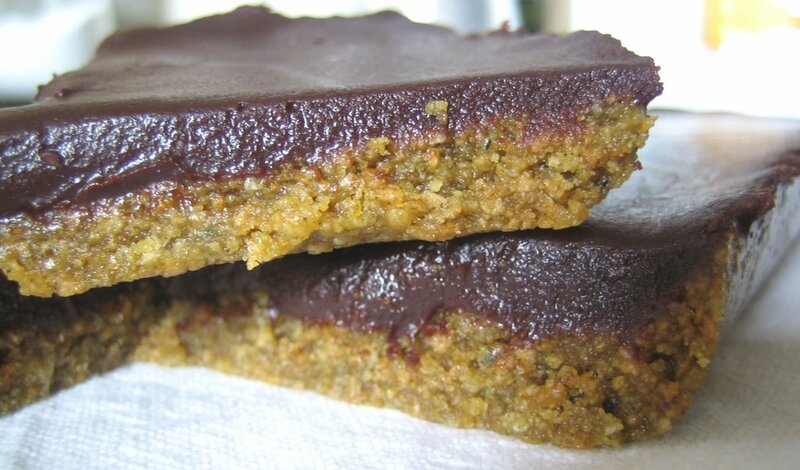 And I promise to make this yummy goody (and blog about it) when I get hemp products. i haven't tried these bars yet either. i love anything with chocolate on top though! oh wow! Those bars look so fudgy and delicious! And to Scott's question - You can buy vegan white chocolate chips on veganessentials.com and also at pangea (veganstore.com). I've never seen them in stores though. This is so exciting! I've never seen any hemp products other than hemp seeds at the health food stores I shop at, and they sound so amazing. Ooohhh, I hope I win! Hi Danielle, well the squares are wheat-free or gluten-free, yes, IF you use a wheat-free or gluten-free cereal. (and yes, they *are* yummy)! Hi suki, thanks! I tried the pumpkin seed butter some while ago now, and I'm not sure why I haven't been using it since we like pumpkin seeds. 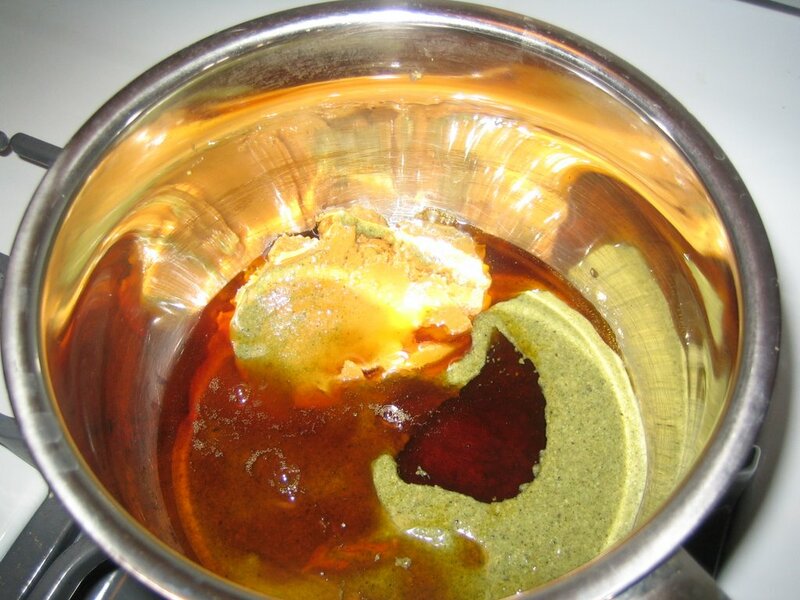 Hemp seed nut butter is probably very similar, except that its taste is more in line with sunflower seeds. Very green in color though! Hi Alison, absolutely - as long as when I announce the winner, that person e-mails me - they win... no blog required! Oh, Susan, I would love to see what kind of creations you would make with hemp products. Your recipes are always the most beautiful-looking and unique, you would do hemp justice indeed! Hi 'Me', thanks! They are very moist, I couldn't resist digging in as soon as I took the picture. mmmm! Danielle, that's a great point. You can easily sub any nut butters in these bars. There is already almond or cashew in them, so you can use more of these, or combine with sunflower butter, peanut butter, etc. Maybe not tahini, because it's a bit bitter, but most everything would work super! Hi Leslie! You can sooo make these too - all stovetop stuff, so no stressing to have to use your oven! Using the processor to crumble the cereal takes just seconds, and you can use whatever cereal you like! Thanks Jennifer, and I'm glad you are enjoying the hemp seeds! Hi Gail... ohhhh, how I love that cake - I'm so pleased you loved it too!!! I love the icing, because it's not sugary sweet, and really I want to just eat it straight with the spoon! Thanks for giving me your feedback on it, that's wonderful. Yes, I think you'd enjoy these squares as well! Hi lady di... I haven't tried this, though essentially that is what nut butters are. If you tried it, you may need to add a touch of oil, unless you have a Vita Mix which I understand can process nuts into nut butter - presto! Rather than attempting to make your own, I would sub another nut butter for now, and use the seeds to make something else, like the Energy Cookies or Apple-Hemp Muffins. If you do attempt it, let us know how it worked! Hi Michelle - I know... chocolate topped on just about anything works, right?! Thank you for posting pictures of your recipes. Now, I want to go and pick up TEV, after having seen all the delicious looking recipes! Oh my, I just got drool on my keyboard hehe:) Dreena, those squares look SO awesome! Hemps seeds are such a nutrient-rich food, it's a darn shame that the masses aren't more knowledgable about this special seed. Have you ever read the Emperor Wears No Clothes? Well I hope I win b/c I've never seen the hemp nut butter before and I really, really wanna make these drool-worthy bars! mmmm, hempy. I've only ever had hemp seeds in Alpsnack bars and those are really tasty. This looks really interesting, and of course, everything is better with chocolate. I can't wait for Easter so I can indulge a bit. hee. I have been sprinkling hemp seed nuts on lots of foods ever since i bought Vive le Vegan, and learned of the many benefits of hemp! I would love to win the basket. Dreena, you are a vegan cooking superwoman! thanks for being so inspiring, with organic, beautiful, healthy, yummy foods. These look delicious! Oh why, oh why have I never cooked with hemp before? Thanks for all the pictures, Dreena. I can't seem to find hemp in very many places to try though. So, pick me! I've never tried hemp, but I'm all for anything that contains chocolate! I love this blog... Thanks for being a constant inspiration. These bars look incredible! I can't wait to try some more hemp treats! I love the flavor! I'm on a mission now to make some hemp waffles!... Off to market! Chocolate + nut butter = perfection! I've never cooked or baked with any hemp products, but after seeing these, I may have to give it a try! These squares look so good! Please help me as I'm hemp-illiterate. Is it a seed or a nut and what does it resemble in taste, if that's possible? Now I need to go find some! okay, something just dawned on me here.. if the kids will like hemp seed butter.. then i really can send a "nut butter" and jam sandwich to school every now and then.. hemp being a seed and all! okay, now i *really* want to try the hemp butter. we like the seeds! Funny, Caroline... thanks! :) I haven't read that book - what am I missing?! Oh, Emily, I am excited about Easter too. Silly me, I mean I have chocolate in the cupboard, but you know, we are just far more justified eating it when it is Easter, or Halloween, or Valentine's, etc, etc! I really want to try those Alpsnacks, but I still haven't seen them here. Thank you Sarah for that... very nice to hear that you are finding some inspiration here - thanks! Yes, Kourtney, chocolate does just about everything good, doesn't it?! Thank you very much, Megan. Wow - hemp waffles??!! I'm very intrigued... please let us know how they turn out - yummy! Hi Starla! Hemp is a seed, not a nut (confusing, I know), and they taste similar to sunflower seeds, but smaller in size much like a sesame seed, and also softer in texture. If you have Vive, there is a section about hemp foods there, covering the some nutritional info, cooking tips, etc. Also, you can visit Manitoba Harvest's site for more detailed info and recipes too! Thanks for the info on the hemp seeds... what I have is deffinitely shelled. I'll keep looking! I guess Capers and Choices probably have them, right? Happy Easter everyone! Eat lots of chocolate!! dreena--I'm totally in love with hemp anything. I currently have hemp nut seeds (for salads) and hemp protein powder (for smoothies) in the fridge and am lovin' it =) I really want to try hemp seed butter...mmm. I love my Manitoba Hemp nut seeds and sprinkle them on lots of different foods. I would love to try some of their other products... That is a great sandwhich idea that you use with your baby,I am going to pass that on to my sister, who is always looking for vegan ideas for her one-yr old! Those look so great I can almost taste them! I have hemp seeds in my fridge, but haven't tried them yet. I really need to pick up your books at the store. Keep up the great work! Yikes! The odds are getting long with all these comments, but count me in. And I really want to try this recipe! Thanks for your helpful information on hemp. YES! I just got VIVE from Borders book store last week but haven't had the time to sit down and go through it. WOW! What a great opportunity for my first (non)baking experience with hemp! PICK ME Please! Tina, yes, Choices and Capers definitely carry Manitoba Harvest hemp seed nuts - and butter - and oil. Hi me, mavis - just saw your comment - your included in the contest... thanks! Hemp, Hemp Hooray for cooking with my favorite plant! Thanks for sharing the recipe.